Hey guys!! Time for another awesome week with our After School Snack Series! This week I am sharing a snack that the kids can help you with, looks amazing and is semi educational! I know that’s a lot to ask from a snack but believe me this snack delivers! 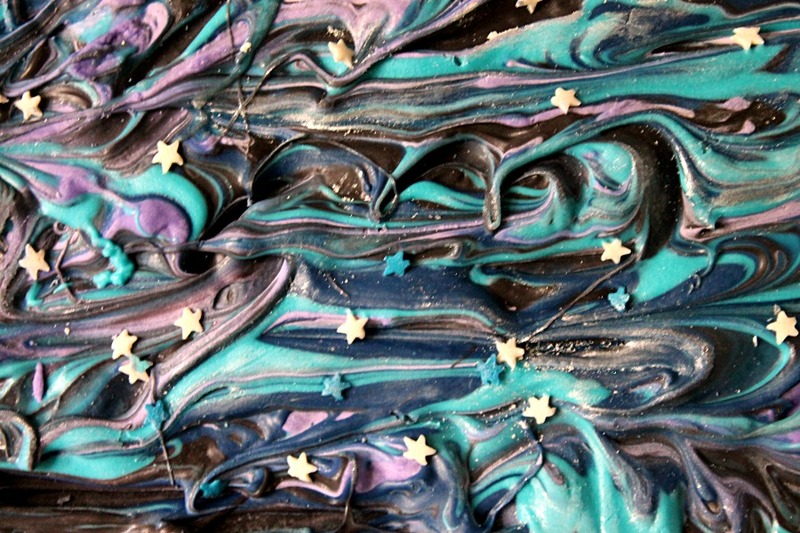 May I present to you Galaxy Bark!!! Galaxy print is everywhere right now, it seems all the kids are obsessed with it lately and my house has not been bypassed by that phase lol. So when I was in the store the other day I saw black candy melts and I was like “whoa what can I make with these” then of course I immediately thought of Galaxy Bark. Chocolate bark is a favorite of mine to make, you can make in a thousand different flavors, a thousand different colors and the kids can help you create it, I just love making it. Plus it takes like minutes to come together, so that’s a win! This makes a great little chocolate treat for the kiddos to snack on while doing homework or for a little treat after dinner. You can turn it educational by talking about galaxies and planets and so on while making the bark, and that can work with so many ages. The bark itself is a snap to make. Just melt your candy melts, I chose black, 2 blues, and purple. 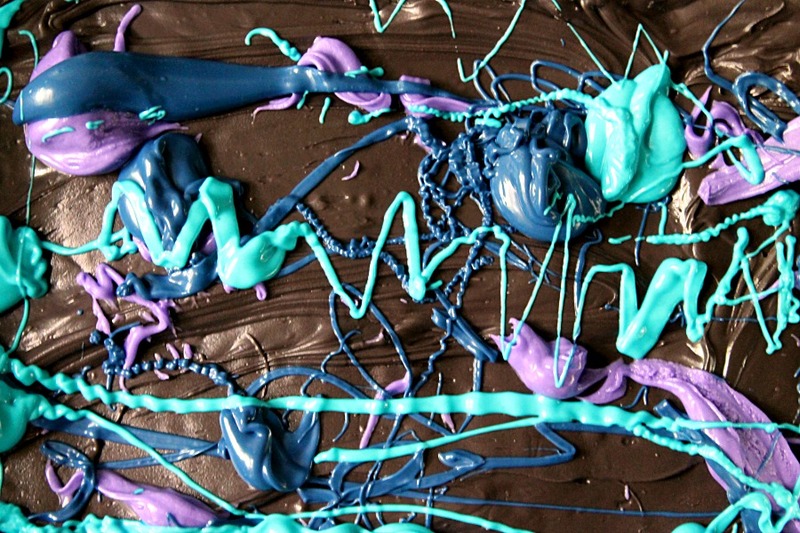 Melt 2 pounds of black candy melts and pour them into a greased and foiled 9×13. Then plop little spoonfuls of the other colors onto the black. Swirl a knife through as much as needed to create the galaxy look. Now to add some sparkle to your galaxy. I just take a little edible glitter dust and brush it on lightly. 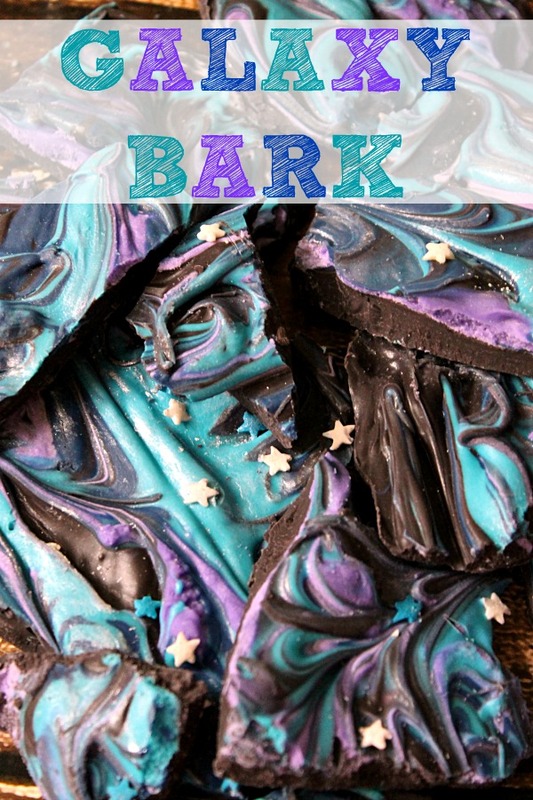 Break it into chunks and admire your awesome Galaxy Bark! This will definitely win you cool points with your kids, or at least your Instagram friends lol! 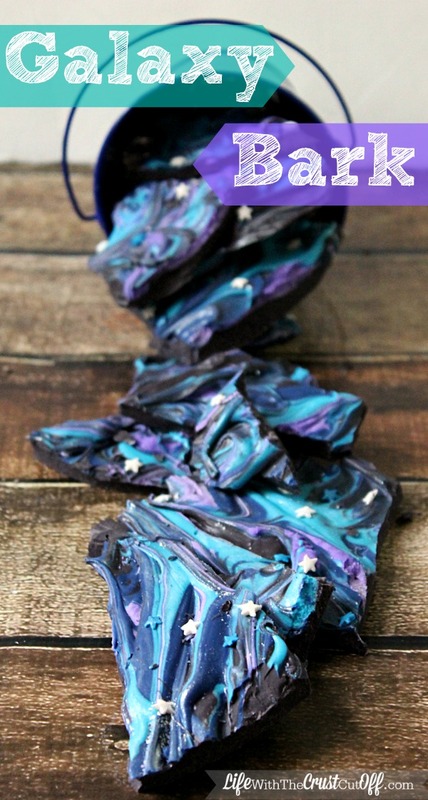 So whip up this Galaxy Bark with your little ones, chat about back in your day Pluto was still a planet and have a great time! Melt the black candy melts in the microwave at 30 second intervals until completely melted. Pour into a foil lined 9x13 pan and spread evenly. Melt other candy melt colors and dollop onto black. Lightly swirl the colors together to make a galaxy look. Brush on a little edible glitter dust. Break into chunks and serve! Head on over to Dana’s to check out her Handheld Strawberry Shortcakes. Yum!!! 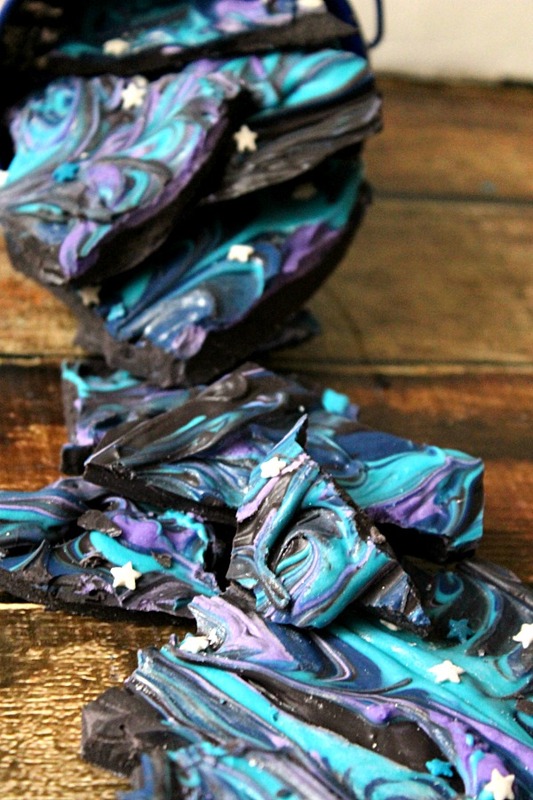 Love your galaxy bark. Looks amazing! This is really cool! My son has always had a fascination with space since he was a toddler (he’s now going on 13). I think he’ll like this. Oh my goodness this looks amazing! My kids would LOVE this in their lunchboxes. Looks yummy just added to my must try folder :)! This looks out of this world! Sorry…couldn’t help it. I can’t wait to try this recipe. YUM! Thank you for linking up with #WakeUpWednesdayLinky Stop by this Wednesday to see if you’ve been featured. Where can you get black chocolate? This looks great! I wanted to let you know that I am featuring this on my site.